Condition: New เฟรทกีต้าร์เฟนเดอร์มิเดียมจัมโบ้ Fender Strat Tele Guitar Medium Jumbo Fret Wire 24 Pack Genuine Fender Part 0991998000 Fender® standard guitar fret wire is pre-cut in 24-piece quantities pre-radiused to 9.5". Measurements: .046" tall, .103" wide. Cut for guitar fingerboards. 6130: Medium jumbo (.106″ x .036″). ข้อมูลจากเว็ปไซต์เฟนเดอร์ *กรุณาตรวจสอบขนาดและรายละเอียดของสินค้าให้แน่ใจว่าตร.. Condition: New เฟรตกีต้าร์ไอบาเนสจัมโบ้เฟรต For S /RG /Prestige/ Signature Model /J custom ModelGenuine Ibanez Guitar Fret Wire Genuine Ibanez Parts No 4FW1J215Jumbor Fret Wire SBB21524pcs/setMade in Japanhttp://www2.ibanez.com/parts/2000_PARTS/El-Bass/Pix-Nut.htm*กรุณาตรวจสอบขนาดและรายละเอียดของสินค้าให้แน่ใจว่าตรงกับสิ่งที่ท่านต้องการก่อนทำการสั่งซื้อ .. Condition: New เฟรตกีต้าร์ดันลอป 6000 ซุปเปอร์จัมโบ้เฟรต Dunlop 6000 Fretwire The largest fret wire available. Size : A=2.990mm x B=1.470mm(0.118"x0.058")The 6000 series is the largest wire Dunlop offers. Both tall and wide, has maximum mass for easy bending and a scalloped feel.Jumbo 6000 fret wire can provide easier playability with better sustain, tone and bending because you don’t have to press as hard to fret the strings, but your fingers probably won’t even touch.. 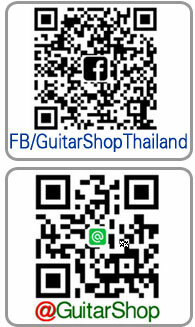 Condition: New เฟรตกีต้าร์ดันลอป 6230 Vintage Strat/TeleDunlop 6000 Fretwire The largest fret wire available. Size : A=1.99mm x B=1.08mm(0.078"x0.043")The 6230 series is a vintage-sized wire as used on early Fender® models.Jumbo 6230 fret wire can provide easier playability with better sustain, tone and bending because you don’t have to press as hard to fret the strings, but your fingers probably won’t even touch the fingerboard, which could take some getting used to if you.. Condition: New เฟรตกีต้าร์ดันลอป 6100 จัมโบ้เฟรต เหมะสำหรับกีตาร์เฟนเดอร์แบบโมเดิล Dunlop 6100 Fretwire The largest fret wire available. Used for Fender GuitarsSize : A=2.790mm x B=1.400mm(0.110″x 0.055″. )The 6100 series is jumbo fret that is both tall and wide.Jumbo 6100 fret wire can provide easier playability with better sustain, tone and bending because you don’t have to press as hard to fret the strings, but your fingers probably won’t even touch the fi.. 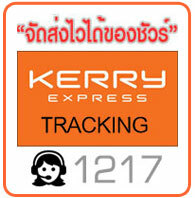 Condition: New เฟรตกีต้าร์ดันลอป 6105 จัมโบ้เฟรต สำหรับกีตาร์ ไอบาเนสเจมหน้าแคบเหมาะสำหรับกีตาร์ 24 เฟรตDunlop 6105 Fretwire(extra high jumbo) Used for Ibanez JEM Size : A=2.30mm x B=1.40mm(0.091″x 0.055″. )The 6105 series is a tall and narrow jumbo wire for players that want more exact intonation. Measures .055" tall and .090" wide. 18% nickel/silver hard alloy. (24) 2-5/8" long pieces. 18% nickel/silver hard alloy. 24 units. *กรุณาตรวจสอบขนาดและรายละเอ.. Condition: New เฟรตกีต้าร์ดันลอป 6150 คลาสสิคจัมโบ้เฟรต เหมะสำหรับกีตาร์แบบโมเดิลร็อคThe 6150 series is a classic jumbo with extra width.Size : A=2.55mm x B=1.12mm(0.100″x 0.044″. )Dunlop Accu-Fret® fretwire is manufactured from a durable nickel/silver alloy and delivers a warm and clear tone-the preferred brand for guitar builders and repairmen worldwide.Jumbo 6150 fret wire can provide easier playability with better sustain, tone and bending because you don’t have to pres.. Condition: New เฟรตกีต้าร์ดันลอป 6130 สำหรับกีตาร์กิ๊บสันเลสพอลDunlop 6100 Fretwire The largest fret wire available.Used for jumbo for Gibson Les Paul GuitarsSize : A=2.69mm x B=0.91mm(0.106″x 0.36″. )The 6130 series is commonly referred to as medium jumbo. This is a perfect size for most vintage Gibson® guitars.The 6130 series is commonly referred to as medium jumbo. This is a perfect size for most vintage Gibson® guitars. Measures .036" tall and .106" wide. 18% nickel.. 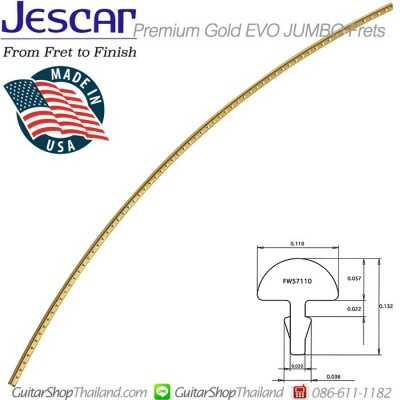 Condition: New Jescar Premium Gold EVO JUMBO Frets USA. 1เส้น ยาว8นิ้วSpecs on this fret wireCrown Height: .057" (1.45mm) Crown Width: .110" (2.79mm) Tang Depth: .074" (1.88mm)This premium JESCAR JUMBO Gold EVO fret wire is both beautiful and durable, a perfect finishing touch for your special build or re-fretting job! Gold EVO is a special alloy that is harder than standard nickel silver, but easier to work than stainless steel. Its rich, .. 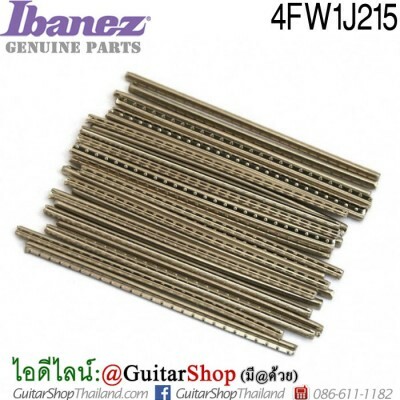 Condition: New เฟรทกีต้าร์เฟนเดอร์จัมโบ้ Fender Strat Tele Guitar Jumbo Fret Wire 24 Pack Genuine Fender Part : 0991999000 Fender® jumbo guitar fret wire is pre-cut in 24-piece quantities pre-radiused to 12". Measurements: .055" tall, .090" wide. Each piece is cut for guitar fingerboards. 6100: Jumbo. The largest fret wire available (.110″ x .055″).*กรุณาตรวจสอบขนาดและรายละเอียดของสินค้าให้แน่ใจว่าตรงกับสิ่งที่ท่านต้องการก่อนทำกา.. 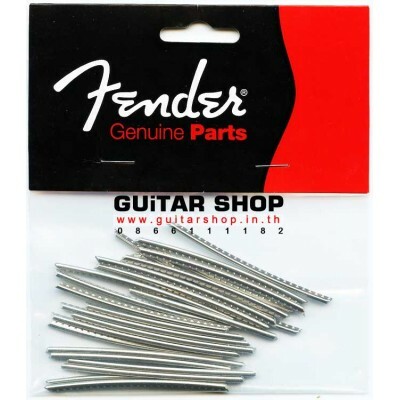 Condition: New เฟรทกีต้าร์เฟนเดอร์วินเทจ Fender Strat Tele Guitar Vintage Fret Wire 24 Pack Genuine Fender Part 0992014000 Fender® vintage-style guitar fret wire is pre-cut in 24-piece quantities pre-radiused to 7.25". Measurements: .045" tall, .083" wide. Cut for guitar fingerboards. 6150: Vintage jumbo. Much wider but not as tall as 6230 (.102″ x .042″). ข้อมูลจากเว็ปไซต์เฟนเดอร์ *กรุณาตรวจสอบขนาดและรายละเอียดข.. Condition: New เฟรตกีต้าร์ดันลอป 6100 จัมโบ้เฟรตหน้ากว้าง สำหรับเบส หรือกีตาร์สายร็อคDunlop 6100 Fretwire The largest fret wire available. Jumbo fret for rock'n'roll and bass and lead guitarSize : A=2.920mm x B=1.270mm(0.115″x 0.050″. 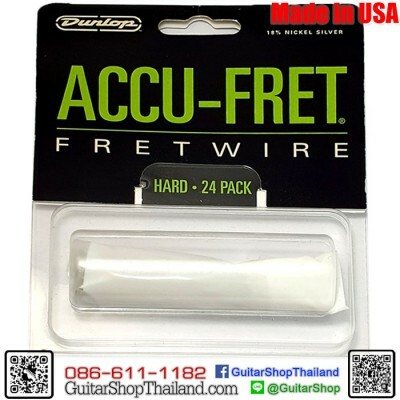 )Dunlop Accu-Fret® fretwire is manufactured from a durable nickel/silver alloy and delivers a warm and clear tone-the preferred brand for guitar builders and repairmen worldwide.Jumbo 6110 fret wire can provide easier playability with bett.. Condition: New เฟรตกีต้าร์สแตนเลส จำนวนหนึ่งเส้น ความยาว 8 นิ้ว (ตัดได้ 3 เฟรต) Guitar stainless steel fretwire Jumbo Jescar stainless steel fretwire is the hardest fret wire Made in USA. This premium JESCAR " JUMBO" stainless steel fret wire is both beautiful and extremely durable, a perfect finishing touch for your special build or re-fretting job! Stainless Steel is just about the hardest type of fretwire you can get, and people who use.. Condition: New Jescar สุดยอดอเมริกันเฟรตกีตาร์ ที่ใช้ในกีตาร์แบรนด์ดังๆ มากมาย อาทิเช่น PRS®, Music Man®, Jackson®, Tom Anderson®, Suhr®เฟรตกีต้าร์สแตนเลสจำนวน 22เฟรต หนึ่งเส้นความยาว 2.75″(70mm.) Jescar stainless steel fret wire is the hardest fret wire Made in USA. This premium JESCAR " JUMBO" stainless steel fret wire is both beautiful and extremely durable, a perfect finishing touch for your special build or re-fretting job! Stainless Steel is just about t.. Condition: New Jescar สุดยอดอเมริกันเฟรตกีตาร์ ที่ใช้ในกีตาร์แบรนด์ดังๆ มากมาย อาทิเช่น PRS®, Music Man®, Jackson®, Tom Anderson®, Suhr®เฟรตกีต้าร์สแตนเลสจำนวน 24เฟรต หนึ่งเส้นความยาว 2.75″(70mm.) Jescar stainless steel fret wire is the hardest fret wire Made in USA. 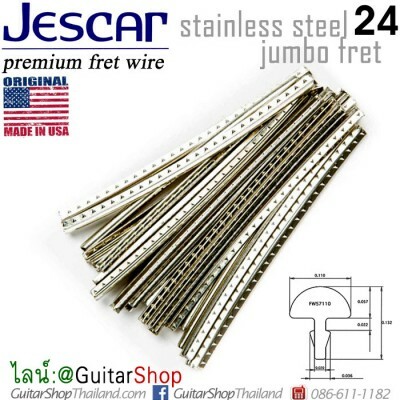 This premium JESCAR " JUMBO" stainless steel fret wire is both beautiful and extremely durable, a perfect finishing touch for your special build or re-fretting job! Stainless Steel is just a.. Condition: New Jescar สุดยอดอเมริกันเฟรตกีตาร์ ที่ใช้ในกีตาร์แบรนด์ดังๆ มากมาย อาทิเช่น PRS®, Music Man®, Jackson®, Tom Anderson®, Suhr®เฟรตกีต้าร์สแตนเลสจำนวนหนึ่งเส้นความยาว 8 นิ้ว(ตัดได้ 3 เฟรต)Jescar stainless steel fret wire is the hardest fret wire Made in USA. This premium JESCAR "SUPER JUMBO" stainless steel fret wire is both beautiful and extremely durable, a perfect finishing touch for your special build or re-fretting job! Stainless Steel is just about the ha..